Finally. I can finally say we are done with this back-breaking and tedious job. It sucked, but it is so worth it. 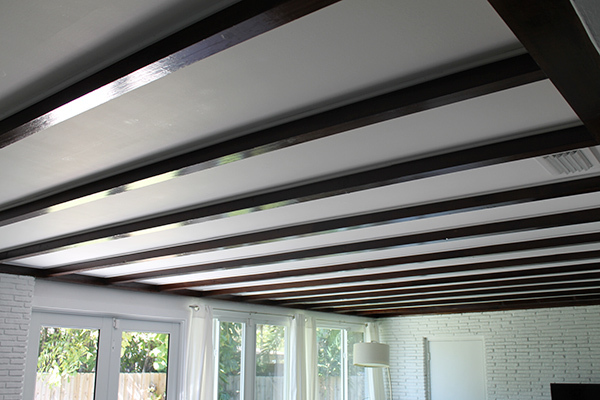 Our exposed beam ceiling has been completely finished! Do a little dance for me. Wrapping this up gets us one step closer to finishing our family room. Let me remind you with what we started with. 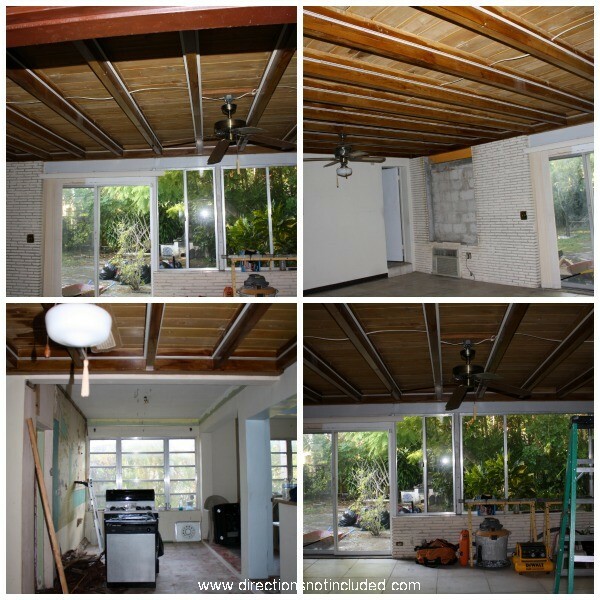 Old orangey stained beams, dropped ceiling tiles with a shoddy electrical throughout, and no insulation. This family room was seriously cringe worthy, but I knew it just needed (and still needs) major elbow grease to make it a dream space. We tore down the mess of a ceiling and fans within a week of closing and did some initial work to clean up the ceiling right away. 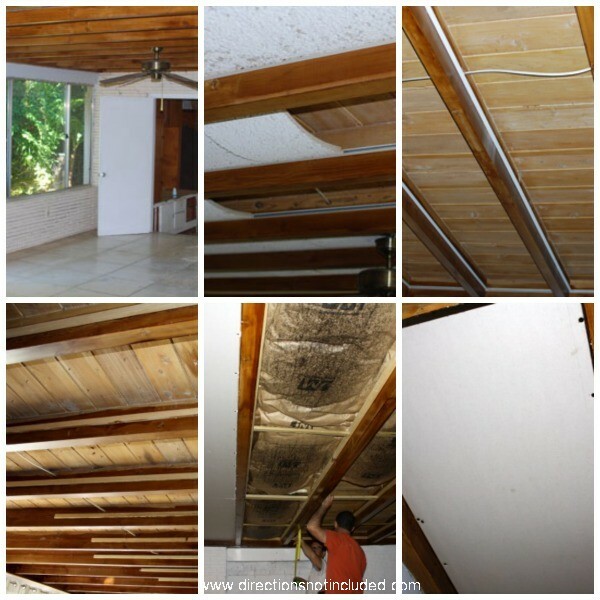 The real back-breaking work included insulating and putting up drywall on the whole ceiling to leave the beams exposed. This is an old house. Nothing is even. That meant each area had to be measured and cut to size one by one. Fun. 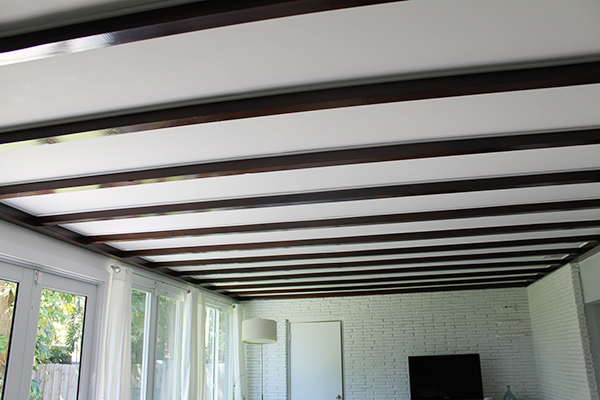 Add re-staining the beams a darker color to match our floors, spackling and painting the dry wall. And if that wasn’t enough, we had to add a white trim to cover the gaps between the beam and the drywall. Never ending project. But it is finally done. And what a magnificent difference it makes in the space. 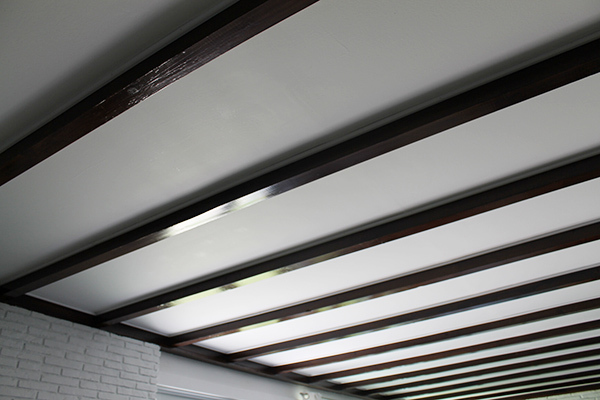 The beams match the flooring throughout the house, the crisp white of the ceiling and the walls makes the space probably my favorite in the house. Seriously, when I look at the before pictures I now understand why my mother-in-law cried when we bought the house. Ray and I knew it had good bones and would be our perfect space but it has taken us some time to get there. 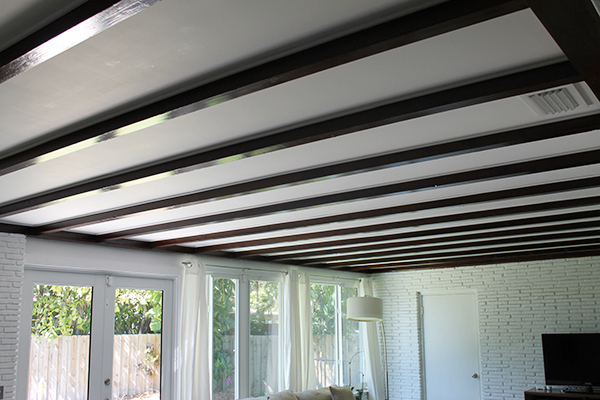 So what do you think of the exposed beam ceiling? We had some people tell us we should have just covered it up and saved ourself the work. That was never an option for us so I’m glad we are finally done! WOW! insanely gorgeous. that is all. Beautiful! Your hard work was so worth it! Wow, it looks amazing! We are trying to keep the original features in our house, I think it is worth the extra effort! It is beautiful! I love it and it was totally worth the work! Thank you! I’m so glad it is over. Hi Caro, it did make a big difference. The room is cooler now during the summer months and it also helped with the sound too. I’m happy we did it.